Maury Regional Health is the largest health care provider between Nashville, Tennessee and Huntsville, Alabama and was named one of the nation’s 15 Top U.S. Health Systems in the recent Truven Health Analytics Top Health System Study. AccuVein Inc. is the global leader in vein illumination and the creator of the world’s only hand-held, non-contact vein finding device. 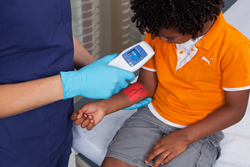 The AccuVein AV400 device provides a map of the patient’s vasculature on the skin’s surface. The AccuVein device has been shown to improve first stick success by a striking 350%, reduce pain by up to 59% and reduce procedure time by 78%. The Infusion Nurses Society (INS) has enhanced and updated its Infusion Therapy Standards of Practice, to include the recommendation of vascular visualization as a standard practice. Maury Regional Health is a not-for-profit regional health system serving southern Middle Tennessee through its hospitals, clinics, surgery centers, outpatient facilities and physician practice group. A four-time Truven Health Analytics Top Health System, the organization is committed to providing innovative care by combining convenient and affordable access with skilled and compassionate patient care. Maury Regional Health is the largest health care provider between Nashville, Tennessee and Huntsville, Alabama, with approximately 3,000 employees throughout the system.